Accepta 7144 is a high performance, environmentally friendly dry microbial based treatment, scientifically formulated to remove fats, oils and grease and so improve the maintenance and on-going management of all types of grease trap installations, drains and drain lines. Accepta 7144 successfully eliminates the drainage problems caused by the accumulation of unwanted fats, oil and grease in commercial kitchens and septic tanks. Accepta 7144 is a powdered treatment product based on micro-organisms, enzymes and nutrients formulated to liquefy and digest a wide range of waste materials including fats, oil, grease, cellulose, starch, surfactants, etc. Accepta 7144 is particularly useful for use in hotels, restaurants, canteens of hospitals, clinics, nursing homes, schools, colleges, universities and many other similar facilities. In the modern environmentally conscious world drain problems can no longer be solved by pouring harsh caustic chemicals or acids down the drain. This is both dangerous for the user and the environment; and can be detrimental to expensive plumbing installations. 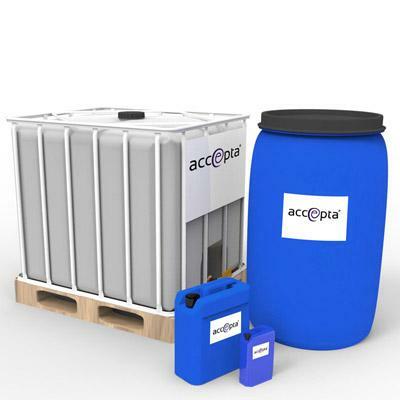 The innovative, environmentally friendly microbial technology of Accepta 7144 converts grease into carbon dioxide and water, and more microbes! Accepta 7144 is able to remove fat and grease deposits because it contains millions of naturally occurring micro-organisms which degrade fats and grease overnight to leave the drainage system flowing and odour free. Accepta 7144 also optimises the performance of treatment plants and enhances the quality of effluent. 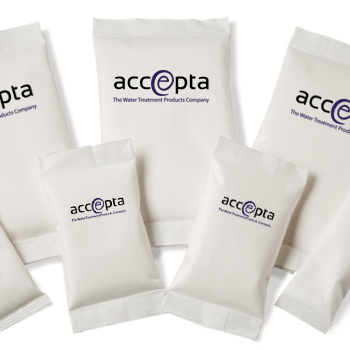 Consistent treatment with Accepta 7144 can also reduce the Biological Oxygen Demand (BOD), Chemical Oxygen Demand (COD) and the Total Suspended Solids (TSS). Empty grease trap prior to treatment. Seeding: Initial dosage to be added directly into the trap. Four sachets/m3. Regular maintenance: Weekly dosage to be added to the lines upstream the day before the weekend. Accepta 7144 dissolves within 5 to 7 min in a bucket of lukewarm water (30 to 40 °C). Let stand for 10 to 15 min to reactivate the bacteria. Then pour the solution into the main sink. To avoid clogging or bad odours, add one sachet to the drain every fortnight. Seeding: Three sachets to be added directly into the tank. Regular maintenance: One sachet every fortnight into the toilet bowl. Allow to stand for 5 to 7 min. Then flush.